Climate change is already having a major impact on the planet, with impacts forecast to worsen significantly, according to the latest summary of peer-reviewed climate science from the Intergovernmental Panel on Climate Change (IPCC). But the risks of climate change can be alleviated with adaptation. While some sectors and regions may benefit from low levels of warming, negative impacts will outweigh positive ones, the report says. Greater impacts will be seen at higher levels of warming. But strong mitigation now could significantly reduce the risk of severe climate impacts. The report, Climate Change 2014: Impacts, Adaptation and Vulnerabilities is released today in Yokohama, Japan (readExplainer: how are IPCC reports written?). Dr Chris Field, co-chair of the report, said the amount of research on climate impacts had doubled between 2005 and 2010. 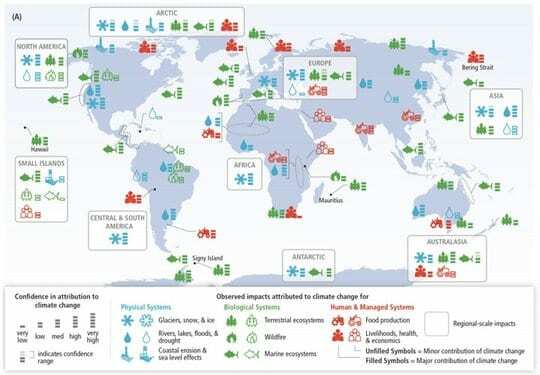 The report assesses current climate impacts, future climate risks and adaptation potential across sectors including the economy, health, agriculture, and security. Global income could fall by 0.2-2% in response to a global average temperature increase of 2C, with worse losses “more likely than not”, according to the report, although it adds that economic forecasts are fraught with difficulties. While some studies predict crop production will rise, most suggest major crop production (wheat, rice, and maize) will fall with 2C warming, with increased variability between years. More people will be displaced by climate impacts such as rising seas, but the report says there is low confidence in estimates of how many people will be affected. There is medium confidence that climate change has already played an indirect role in recent conflict and civil wars, and will increase national security threats in the future. Climate change will exacerbate health problems up to 2050, and post-2050 is likely to increase ill-health. Deaths have already risen thanks to extreme heat, although there may have been some fall in deaths from extreme cold (read more abouthealth impacts). The tropical and subtropical regions will see more frequent drought, and globally water quality is expected to decline. Climate impacts will disproportionately affect developing nations and people in poverty, although climate change has already been felt across the globe. The report also summarises impacts already seen, mostly in the natural world. Glaciers and permafrost are melting, and scientists have documented shifts in species’ distributions. Many countries have already taken steps to develop adaptation plans, the report says, which could significantly reduce further climate risks. Climate Change 2014: Impacts, Adaptation and Vulnerabilities is the second of three reports to make up the IPCC Fifth Assessment Report. The first, The Physical Science basis, was released in September 2013. The final part, Mitigation of Climate Change, will be released next month, with the compiled report due in late 2014. Conversation author and climate scientist at Victoria UniversityRoger Jones was at the report meetings in Yokohama. A coordinating author on the report, he asked fellow authors what they thought was the key message. Their response follows. As a Lead Author on adaptation in the third, fourth and now fifth assessment reports, I have seen the evolution of the topic’s treatment from a single chapter in the third report, to one-and-a-half chapters in the fourth, to four chapters in the fifth. This represented the demand for information from governments (who make up the IPCC and provide the outline of topics that the scientists are then asked to write about). The Fifth Assessment was able to provide much more information on planning adaptation, but less on actual implementation of adaptation plans. This illustrates both the explosion in adaptation plans and actions around the world and also the limitations of the IPCC’s strict restrictions on relying on the peer-reviewed scientific literature and avoiding other sources of information. This meant that a significant body of knowledge generated by practitioners doing adaptation on the ground, but who do not write peer-reviewed journal articles, were difficult to capture in the assessment due to the strict IPCC rule on what information can be cited and what cannot be cited. Another problem with the IPCC, at least for the major assessment reports, is the long time that they take to go through the review process and finally get published. Thus they are out of date by at least a year on the day they are published. At least when it comes to information and knowledge on adaptation , where the need for information is urgent, this long process is not really fit for purpose anymore. The future of IPCC reports might thus lie in more, quicker, special reports rather than the huge tomes every six or so years. Building on the previous IPCC reports, the new IPCC assessment report makes it clear that continued climate change will indeed create an increased extinction risk for a large fraction of terrestrial and freshwater species during and beyond the 21st century, especially as climate change interacts with other pressures on species, such as habitat modification, over-exploitation, pollution and invasive species. Although it is not possible to define the exact number of species at risk, we do know that this number could be large, and that it will increase with both the magnitude and rate of climate change. Global species extinctions, many of them caused by human activities, are already occurring at rates that approach or exceed the upper limits of observed natural rates of extinction in the fossil record. Continued climate change will accelerate this rate of global extinction, perhaps dramatically. There will be complex impacts on rural areas around the world, going well beyond the projected decreases in yield for the major food crops (vitally important as those are). Rural people will also suffer impacts on the cash crops they depend on for their livelihoods, on their livestock, their water supply, their infrastructure, and their health: some, who are net buyers of food, will suffer from higher food prices. Generalising across the rural areas of developing and developed countries is hard; the policy and demographic contexts are very different, though there are common features of remoteness, lack of access to decision-making, and knowledge gaps on rural realities. There are emerging questions on how the drive to biofuels and other forms of renewable energy, and to the mitigation of carbon emissions by reforestation, will affect rural people. To support decisions on climate mitigation, it is helpful to compare the impacts on freshwater systems that are projected under different amounts of future greenhouse gas emissions or global warming. In our work for the Fifth Assessment Report, we could for the first time evaluate a large number of modelling studies that made such comparisons. These studies, with large but better quantified uncertainties, clearly demonstrate that freshwater-related risks of climate change increase significantly with global warming. Low-emission scenarios lead, for example, to lower increases of flood occurrence as well as to lower reductions of renewable water resources, and therefore to lower costs of adaptation. We have already observed impacts of climate change on agriculture. We have assessed the amount of climate change we can adapt to. There’s a lot we can’t adapt to even at 2C. At 4C the impacts are very high and we cannot adapt to them. Reducing emissions reduces global temperature rise, and also the rate of temperature rise. This makes it easier to the adapt to the remaining impacts. We’ve left it too late to reduce emissions enough to avoid all of the impacts of climate change, but we could still avoid a large proportion of them by reducing emissions soon, and fast.